The easy way to schedule, manage, and report your projects. 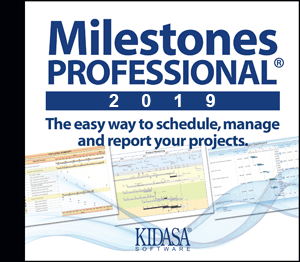 Our top-end product, Milestones Professional works stand-alone or as a presentation reporting add on for Microsoft Project or Primavera via XML. Upgrade Now! A serial number is required to purchase an upgrade from an earlier version. Your serial number can be found: In the Help Tab > About, or on the first page of your manual, or in your email purchase record. Contact us if you can not locate your serial number. 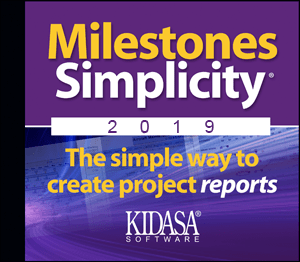 Milestones Simplicity includes all you need to create colorful presentation Gantt charts in a variety of formats, Simply! Buy now or upgrade from a previous version! You can also use your Simplicity serial number to upgrade to Milestones Professional. A serial number is required to purchase an upgrade from an earlier version. Your serial number can be found: In the Help Tab > About, or in your email purchase record. Contact us if you can not locate your serial number.